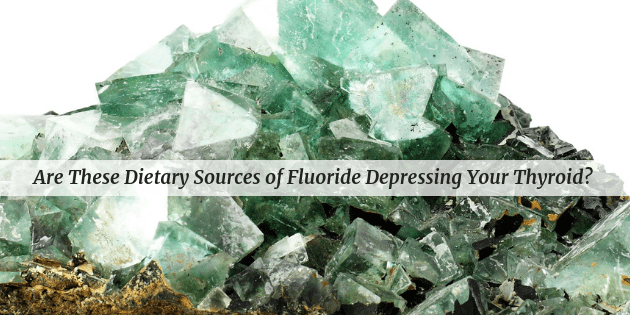 Are These Dietary Sources of Fluoride Depressing Your Thyroid? Today’s guest post is by my friend Melissa Gallico. She addresses the dangers of fluoride and fluoridated water and possible dietary sources of fluoride that may be causing low thyroid function. →Be sure to check out “About the Author” below. Over 70% of public water supplies in the United States are artificially fluoridated. The Centers for Disease Control (CDC) recommends the addition of fluoride as a way of reducing the rate of cavities in the general population, but fluoride affects more than just teeth. Given the epidemic rate of thyroid disorders, you might be surprised to hear that a chemical indiscriminately added to public water supplies in cities throughout the United States—as well as several other countries including Canada, Australia, New Zealand, England, Ireland, and Brazil—is a known thyroid depressant. Until the 1950s, many doctors used fluoride as a treatment to lower thyroid activity in patients with overactive thyroid glands.¹ A dose as low as 2 to 5 milligrams per day over a period of a few months was enough to decrease thyroid activity in their patients. This is the same amount of fluoride many people consume on a daily basis, especially if they live in a town where the public water supply is artificially fluoridated. Fluoride is a controversial topic for a lot of people. Government authorities insist there are no negative side effects to adding fluoride to public water supplies at the dose they deem optimal, but they also have a history of underestimating the longterm effects of certain chemicals when a large financial interest is at stake—especially natural contaminants like lead, mercury, and fluoride. I did not question fluoridation until I had the experience of living in several non-fluoridated countries and saw firsthand the dramatic effect it had on my health. 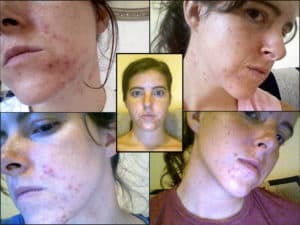 The most obvious difference was the disappearance of the chronic cystic acne that plagued me anytime I lived in fluoridated cities in the United States. 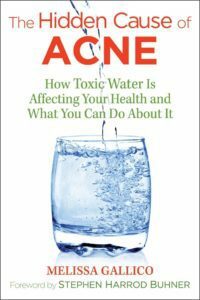 Fluoride-induced acne is not an uncommon condition, but few people know about it because fluoride sneaks into our daily lives in unexpected ways. Once I identified dietary fluoride as the root cause of my acne, I was able to heal my skin completely by learning how to avoid excess fluoride in my food and water. More subtle effects included a lifting of the chronic depression I had come to think of as normal and an overall improvement in mental clarity and emotional health. Fluorinated chemicals make their way into food cooked in non-stick cookware like Teflon. It is also a common ingredient in many pharmaceuticals, including Prozac, Paxil, Cipro, Flonase, and Lipitor to name just a few. The long-term solution to chronic fluoride intoxication is to end the obsolete practice of adding fluoride to public water supplies. (Click here to sign my petition to end fluoridation). In the meantime, here are five steps you can take today to lower your exposure to this dangerous chemical. To find out if your water supply is fluoridated, ask your local water provider for their annual “Consumer Confidence Report” or search for it online. Look for a fluoride level close to the mean fluoride content of freshwater which is 0.05 ppm. (The amount currently recommended by the CDC is fourteen times this amount.) Reverse osmosis filters are effective at removing fluoride. Purchase organic food when possible, but especially when it comes to grape products and poultry. Switch from traditional black tea to herbal alternatives, such as peppermint, raspberry leaf, or yerba mate. Upgrade any fluorinated non-stick cookware to quality ceramic, stainless steel, or cast iron. Going off certain medications can be dangerous. If you are discontinuing the use of a fluorinated pharmaceutical, consult a knowledgeable naturopath or functional medicine practitioner to help you through it. For a listing of fluorinated pharmaceuticals, visit http://www.slweb.org/ftrcfluorinatedpharm.html. Connett, Paul, James Beck, and H. S. Micklem. 2010. The Case Against Fluoride. White River Junction, Vt.: Chelsea Green Publishing. Melissa Gallico is a former military intelligence officer, Fulbright scholar, and FBI analyst who discovered fluoride was the root cause of the cystic acne she struggled with for nearly 20 years. She is the author of F Is for Fluoride: A Feasible Fairytale for Freethinkers 15 and Up and The Hidden Cause of Acne: How Toxic Water is Affecting Your Health and What You Can Do About It. 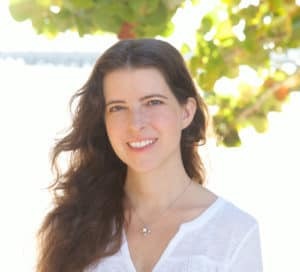 For a free cheat sheet on the hidden source of fluoride, subscribe to Melissa Gallico’s newsletter at www.HiddenCauseofAcne.com.